This case of 7 Boxes of Miele Care Collection Dishwasher Reactivation Salt is for use in dishwasher water softeners. Tap water often contains lime. Your dishwasher has a water softening unit which withdraws the harmful lime from the water so that lime is not deposited on dishes and the dishwasher. This is a case of seven 3.75 lb. (1.5kg) boxes. 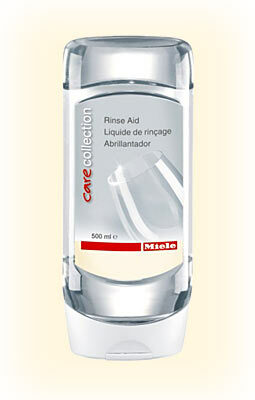 Use Miele Care Collection Rinse Aid in your dishwasher for a spotless, crystal-clear shine. 16.9 fl. oz. (500ml) bottle.